A sprinkle of cheese, a coating of “Robin Hood razzle dazzle”, three elaborate illusions and a Shyamalan twist make up this ludicrous and funny heist/magic caper. Add to that a stellar cast including Michael Caine, Morgan Freeman, Mark Ruffalo , Isla Fisher, Woody Harrelson, Jesse Eisenberg and Melanie Laurent and you get a concoction that plays out a little like one of the Ocean’s films. Jack Wilder, Henley Reeves, Merritt McKinney and J. Daniel Atlas are plucked from obscurity by a mysterious figure to make up the most prestigious magic act of all time The Four Horsemen. Though magic is on the cards their main aim is to target large corporations who have done the public a disservice. The banks, insurance companies and surveillance are the targets who they not only steal from them but humiliate in front of an audience too. Once I got over the fact there was absolutely no tension (which to be quite honest I did after watching the trailer for the first time two months ago) I chuckled my way through this silly farce of a film and genuinely enjoyed it. I call it a farce as the tricks are so preposterous and if you really think about it I’m not sure they are actually possible. Even Morgan Freeman voiceover explaining how they dun it couldn’t convince me. Woody Harrelson, as ever, is having a ball, hypnotising members of the public for his own gain as a mentalist. 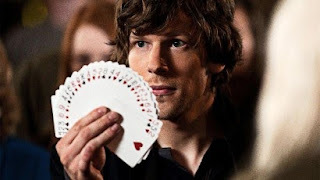 Jesse Eisenberg masters sleight of hand and smugness but Isla Fisher and Dave Franco don’t do very much and in fact when the horsemen are interrogated by the police they don’t even feature as they are so inconsequential to the plot. On the hunt for the horsemen are Mark Ruffalo, as a cop, and Melanie Laurent as Interpol – who aim for some semblance of sexual tension but fail miserably – the sexiest part of the film is when Ruffalo gets rugby tackled by a horde of people… or maybe when Ruffalo and Franco go at it in frenetic hand to hand combat and chase. Both stick in the memory. I can see why those involved would be attracted to this project – it had the potential to be a highly entertaining caper whilst saying something pertinent. Unfortunately not much character development or serious business is undertaken in the 115minute running time. Still, it is pretty fun.